In attempt to deliver more relevant advertisements, Facebook is collecting feedback from users that hide ads in the News Feed. 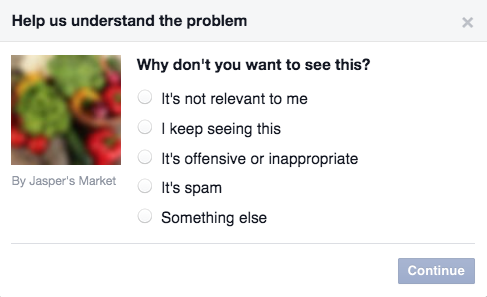 According to an announcement from Facebook, when someone chooses “I don’t want to see this” on a story, the social network makes an effort to show that user fewer stories that are similar to the one they hid. Now, however, when someone makes this selection on an advertisement, the social network is also asking them why they don’t want to see the ad (see image below). During testing Facebook notes that it stopped showing ads that people marked as offensive or inappropriate. The result was a decrease in the number of ads that people reported as offensive or inappropriate, which means Facebook was able to take signals from a small number of people on a small number of ads to improve the experience for everyone else on the social network. In addition to just collecting feedback from those who hide ads, Facebook is putting emphasis on a small group of people that share feedback less frequently than others. This means that Facebook is weighting feedback based on how often someone hides ads and other stories within the News Feed. The social network notes that this will affect the type of ads it shows everyone, but will have a bigger impact on those who don't hide ads often. Testing of this feature revealed that people who rarely hide ads ended up hiding 30 percent fewer ads with this change. It is also important to note Facebook is assuring advertisers that most of them will see no change to the delivery of their ads or how their ads are shown on the social network. In fact, the updates will help Facebook make sure that ads are being put in front of the right people.